When relationships between teams and engine manufacturers come to an end, it's not always easy for the two parties to see through their last few races together. Williams and BMW had a tense relationship at the best of times and struggled to keep things civilised at the end of 2005, but still managed to separate in a dignified way, in spite of winning no races and finishing only fifth in the Constructors' Championship - the worst result in their six seasons together. Throughout this season it's well know the relationship between McLaren and Honda has gone down the drain in a very clear way, with Eric Boullier and Fernando Alonso taking any opportunity they get to bash the Japanese manufacturer and even Stoffel Vandoorne joining the party recently, but there has been a remarkable restraint from the Honda side, so the war of words has been pretty much one sided in this case. What is happening between Renault and Toro Rosso - and that means Red Bull, because no one in the Italian team would be so harsh against the company that supplies engines to both of Dieter Mateschitz's teams without letting the big boss know - has descended into a new level and there was the serious risk, in Interlagos, of things turning physical between members of the two companies' senior management. 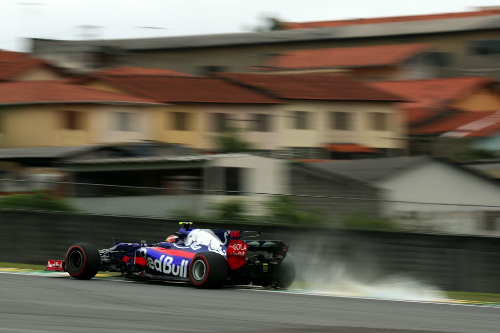 In the last four Grand Prix - Japan, United States, Mexico and Brazil - Toro Rosso drivers suffered Power Unit-related grid penalties on six occasions, which means only twice - Gasly in Japan and Kvyat in the United States - they could start the race from the positions they qualified on. The Russian scored the team's only point in the last five races and now there's also the serious possibility both Brendan Hartley and Pierre Gasly will take further grid penalties in Abu Dhabi as the New Zealander retired in Interlagos with another Power Unit related issue while the Frenchman just managed to cross the line after all systems shut down on the final lap after another MGU-K problem. With Toro Rosso and Renault, together with Haas, involved in a financially important fight for 6th place in the Constructors' Championship, tensions between the two companies started to rise, because there's a difference of an estimated ten million dollars between getting into the Top 6 or finishing just in 8th place. Given how flimsy the relationship between the two parties already was, it was not a surprise Toro Rosso issued a very strongly worded statement the day after - and it required a few people inside the team to convince Franz Tost to actually tone it down, from what I could gather... - in which the volatile Austrian turned the accusations around: "It comes as a big surprise to the team that Cyril Abiteboul has suggested to the media that the problems Toro Rosso suffers with the power unit are primarily team related, and the way in which the power unit is operated in the STR12 chassis." On reading this statement, and being a clever man, Abiteboul opted to go and vent his fury with 74-year-old Helmut Marko, on Saturday morning, rather than confront Franz Tost, the man who had issued the Toro Rosso statement. That was a clever move, because Tost is known to lose his temper quickly and resort to physical violence - as Scott Speed certainly remembers - so a punch-up in the paddock was narrowly avoided. Is there any way for the two parties to save some dignity when they finally stop working together in Abu Dhabi? I would like to say there is, because the current situation is doing no one any good, but I have to say I doubt very much that will be the case. With both Toro Rosso drivers set to take on more grid penalties and run with very old parts in the final race of the season, Franz Tost is going to be even more incensed if Renault scores the five points they need to get past the Italian team in the championship. And I'm pretty sure his final words of the season won't be very nice towards Renault.